When last we left our oddest of odd couples, they were facing a potentially world ending crisis instigated by Chameleon, an artificial intelligence and the legions of LMD’s* who had flocked to cause and would willingly consume any amount, and flavour of, Kool Aid their new robot master asked them too. It was a situation made infinitely more complicated by the involvement of Spidey’s long deceased parents, SHIELD, Deadpool’s former / current, I would add delete as applicable but I’m not sure even Wade knows their current status, partners in crime and enough toing and froing in time to melt the master of the Tardis’ brain. And that’s where things immediately pick up in My Two Dads as the present and future versions of Wade and Pete team up to take on the ever-present threat posed by the aforementioned android, Master Matrix. 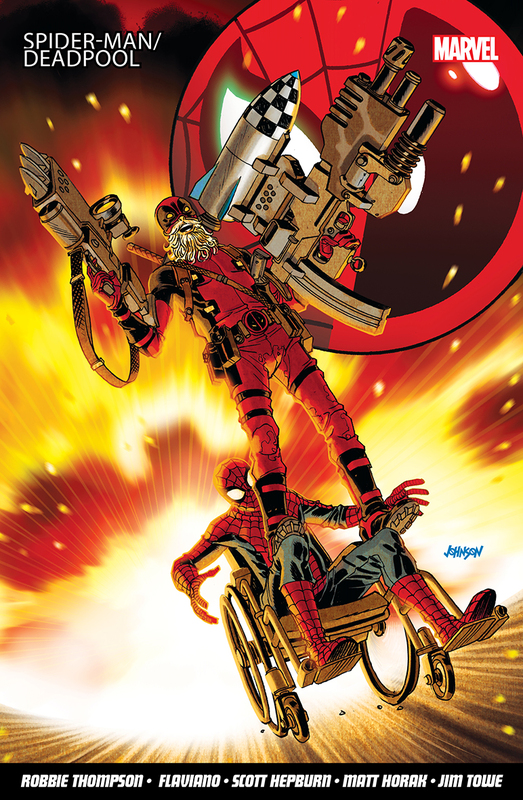 Things though, as they’re often want to do when Spider-Man and Deadpool are involved, go seriously sideways as their solution turns their enemy into their ward and Pete and Wade into the Universe’s least likely parents.